This rustic waterfront lodge on Toledo Bend is the perfect place for your next vacation or fishing tournament! Truly enjoy your time at the lake in Holy Toledo I. Our lake house lodge has 3 bedrooms, 2 baths, and can comfortably sleep up to 6-8 people in beds. Holy Toldedo's lake views provide spectacular sunsets or a magnificent moon view. Great area of the lake for fishing and great place to relax. Large covered boat shed to accommodate 2 trailered boats. An extra-large deck will be ideal for outdoor gatherings, meals, or just watching sunsets over the lake. Warm your winter evenings with a wood burning furnace! Holy Toledo I has a king in the master along with connected full master bath. The 2 guest rooms each have twin over full bunk beds and share a full bathroom. A flat-screen TV with satellite TV along with DVD player provide entertainment. WIFI internet access is provided for those that need to remain connected, however, we recommend you enjoy the Lake instead. 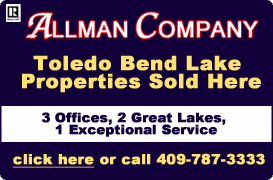 Holy Toledo I also includes a washer and dryer, propane cooking grill, gas BBQ grill, and cast iron pots for your use. Full-size refrigerator/freezer, dining table with six chairs, cookware, and dinnerware, microwave, and coffee maker with some additional amenities. We also supply sheets, blankets, and comforters for the beds and bathroom towels with some small bottles of shampoo, lotion, and bars of body soap. Lakefront Grocery convenience store/diner that serves breakfast, lunch, and dinner along with ice, gas and diesel pumps, is less than a mile away. Located only 8 miles from Toledo town and Tackle. This beautiful lodge is only a 3-hour drive from Houston or 4 hours from Dallas. For our Cajun friends heading North for a tournament or weekend getaway, you'll be here in 3 hours. Check-in time is 2 pm and checkout time is 10 am. Early arrivals are sometimes possible. Please discuss in advance. With 1300 Sq feet of space and a huge deck that surrounds the lodge, you have ample room to fit your friends or family. Come relax, sit on the deck, and let your cares float away. $50.00 Non Refundable Pet charge $100 cleaning fee and $100 refundable damage deposit. 2-night minimum. Weekly and longer term rates available. Contact me for details.